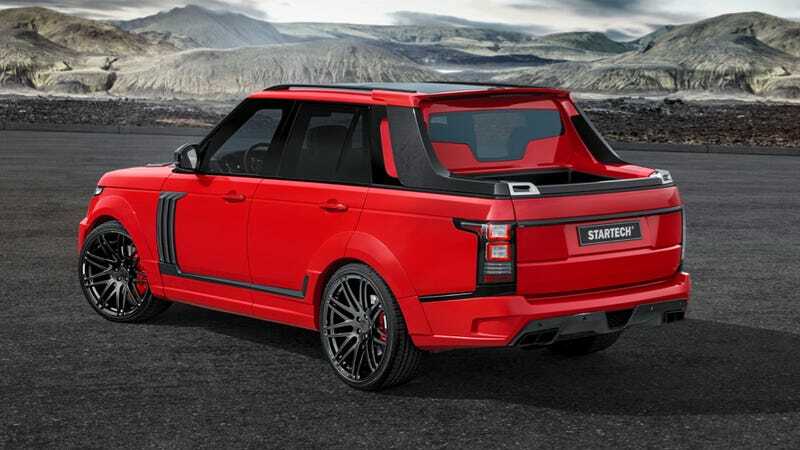 Luxo-tuner Startech has sliced the back off a long wheelbase Range Rover and turned it into a little monster like something between a cereal box toy and Megazord. It's wider and faster than a regular Range Rover, and since it has a "bed" you can reportedly skirt luxury taxes importing it as a commercial vehicle. Startech, relative of equally-absurd car-decorating outfit Brabus (could you guess?) just pulled the cover off this at the 2015 Shanghai Auto Show. Output's squeezed up to 526 horsepower, 0-60 is 5.3 seconds, top speed's electronically limited to 155 MPH. Those rims are 23" tall and 11" wide, the whole rig is about 3" wider than a regular Range Rover. New C-pillars tie the bed to the rest of the body, and the whole panoramic sunroof is still intact. "the pickup concept goes beyond merely offering functional and visual advantages: in many countries of the world luxury cars such as the Range Rover are subject to high import duties and luxury taxes. The conversion to a pickup means that the Startech multi-utility vehicle meets the prerequisites to be registered as a commercial vehicle in many countries, which often eliminates these fees when the vehicle is imported. As a result, despite the elaborate conversion, the exclusive Startech Pickup may be cheaper for owners in such states than a production luxury SUV." Thank goodness, because what an inconvenience "import duties and luxury taxes" must be for all the sultans who will be buying six of these for their groundskeepers to use.